The first and only '07.5-'19 6.7L intake manifold mounted grid heater that meets the Cummins spec for heating element support, amp draw, and temperature rise. With the introduction of the 2010 6.7L Cummins, space under the hood has been reduced even further. While our Arctic Heat I/C pipe grid heaters have been extremely popular for the '07.5-'09 trucks, we had to start looking for a new location on the 2010+ models. The solution to this problem? The Mega-Flo TVM (throttle valve mounted) grid heater! 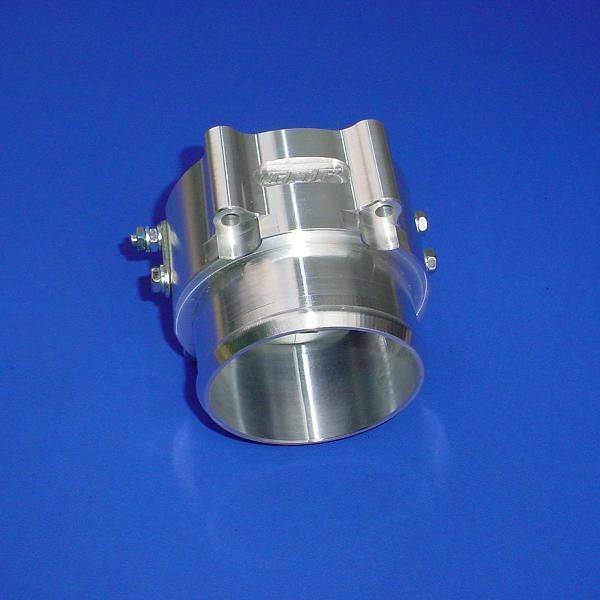 The Mega-Flo TVM heater is CNC machined and directly replaces the unused throttle valve on deleted trucks. * Precision detail allows the Mega-Flo TVM to work with ANY intake manifold that retains the throttle valve mounting flange and all aftermarket I/C pipes (boost tubes). As we have all come to know, the 6.7L Cummins is sorely lacking in the airflow department. With new emissions equipment and poorly designed factory parts the 6.7L was set up to fail. The combination of an overly restrictive stock grid heater (that sits down insidethe intake plenum blocking airflow by 30%), 5.9L size valves, and EGR have sent exhaust gas temperatures thru the roof and mileage plummeting. Bottom line, the 6.7L is STARVING for intake airflow. Trucks that run in warmer climates, whether stock or highly modified, have the option of grinding out the stock grid heater or running the GDP "Air-Boss 67” elevated intake plenum. But, what about a truck that operates in cooler climates and MUST have a grid heater to aid in cold weather starting? That's where the "Mega-Flo” Throttle Valve Grid Heater shines! At GDP we've designed a new, high flow, intake manifold mounted grid heater that is a direct replacement for the factory throttle valve. This allows the installation of an "Air-Boss 67” elevated intake plenum or removal of the grid heater from the stock plate while still retaining a grid heater in the system. All of the airflow benefits without the associated cold weather hard start or no start condition of a full grid heater delete. 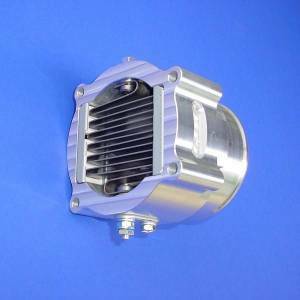 By installing the Mega-Flo Throttle Valve Grid Heater, along with an intake plenum such as the "Air-Boss 67”, the grid heater is moved to a pre-plenum inlet position and out of the turning radius into the head. This allows massive airflow improvement without cold weather hard starts and none of the possible random codes associated with a simple grid heater delete. 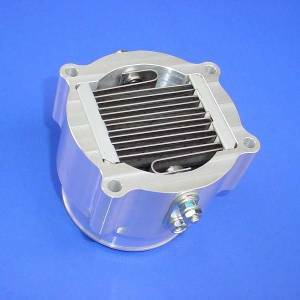 - Precision CNC machined Grid Heater housing. - Simple, direct bolt-in installation using factory hardware. - Works with ANY intake manifold that retains the throttle valve mounting flange. 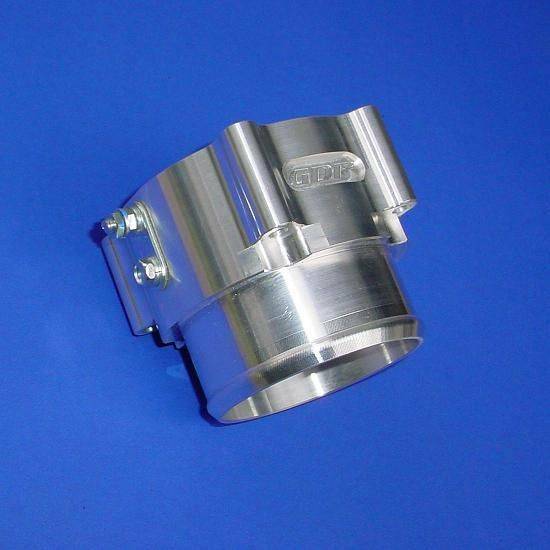 - Works with ALL aftermarket I/C pipes (boost tubes). - Supplied grid heater is perfectly matched for amp draw producing full heat output while being 100% code free. - Uses the stock factory power wire with no ground wire needed. - Supplied with new factory gasket. *Note: Delete tuner required for installation. easy install- bolted right to the S-2 air intake flange I bought. cranks right up in cold. Installed this along with the intake horn and air boss. Went up elk hunting and was -2, no power from the cabin to plug in. Fired right up and was really smooth. Great products from GDP. Couldn't be more satisfied. If you pull your intake horn off you can actually see the soot build up at the grid heater restricting air flow and heater performance. This new grid heater cycles less frequently, and is definitely less restrictive just by looking at it. First off, the fit and finish on this item is AWESOME, just like everything else i have seen from GDP!!! I installed the throttle valve grid heater and this morning it was 2 degrees at my house in ALASKA. My truck started great and ran smoother than with the stock heater. Since I've installed your Grid heater delete, the trucks EGTs have dropped. This Grid heater was EASY to install. Works great, no smoke on cold startup or noise. Thank you for your effort designing these great products! Great product only regret is you can't see more of it. This thing runs a heating element just like the factory only better and less restrictive. Simple install and great workman ship. This is a must if you want to keep your grid heater and gain performance. Great fit and function.